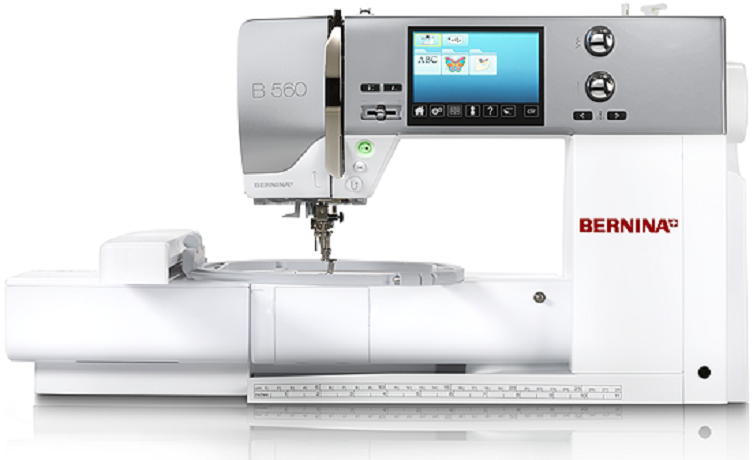 The BERNINA 560 is equipped with the embroidery function as standard and can be enhanced with the embroidery module. 70 embroidery patterns are already integrated into the BERNINA 560’s software. Right from the very start, a vast selection of attractive embroidery are patterns for sophisticated embroidery available that you can easily and quickly select using the touchscreen. With this intelligent combination of sewing and embroidery functions on the BERNINA 560, you can design even more versatile sewing projects. The BERNINA 560 is equipped with the embroidery function as standard. 70 embroidery patterns are already integrated into the BERNINA 560’s software. Right from the very start, there is a vast selection of attractive embroidery patterns for sophisticated embroidery available that you can easily and quickly select using the touchscreen. With this intelligent combination of sewing and embroidery functions on the BERNINA 560, you can design even more versatile sewing projects.